The Old St. Ferdinand Shrine is located on the site of the oldest Catholic church west of the Mississippi River. 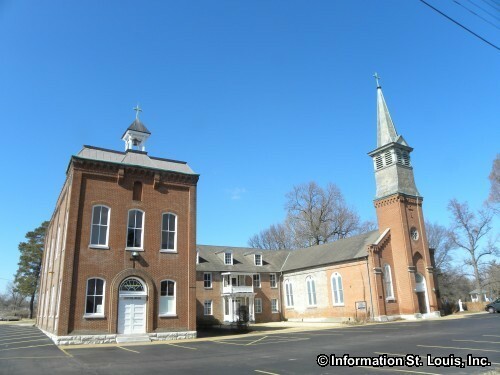 When the Valley of Florissant was settled in the late 1770's, the Spanish gave the name of "St Ferdinand" to the church that was located there. The cornerstone for the present church was laid in 1821. A convent had first been built in 1819 for the Religious of the Sacred Heart who left in 1846 and were replaced by the Sisters of Loretto. A school was built in 1880 to serve the community and the church was expanded. In 1957, as the parish population was getting smaller, the diocese decided to close the parish and the church and adjoining buildings were in danger of being torn down. A group of concerned residents formed the "Friends of Old St. Ferdinand" and raised money to purchase the church complex. In 1960 the St. Louis Archdiocese named the building a "Shrine" and in 1979 it was listed on the National Register of Historic Places. Today it is a museum and can be toured. A gift shop is also on the premises. Daily tours are available by appointment. The Shrine is also open April 1st through October 31st, on Sundays 1pm-4pm, for tours without an appointment. Admission is free, but a donation is appreciated.